The Department of Public Works and Highways (DPWH) has officially opened the flyover that connects Tandang Sora Avenue to Luzon Avenue in Quezon City by going over Commonwealth Avenue. 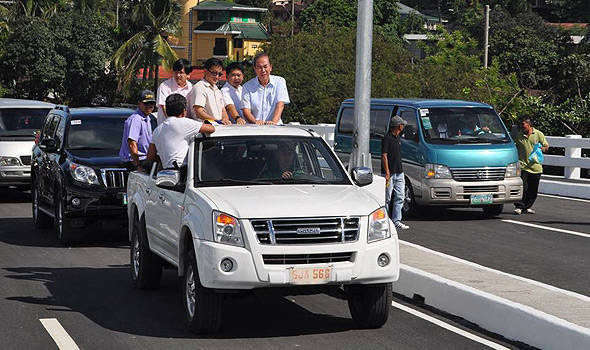 The 18-meter-wide flyover was reportedly constructed at a cost of P570 million. According to the DPWH, it serves as a vital component of the C-5 Extension Project as it interconnects Luzon Avenue to C-5/Katipunan Avenue in Quezon City. The opening of this flyover will also encourage motorists from the South Luzon Expressway who are headed toward the North Luzon Expressway (NLEX) and vice versa to skip EDSA by taking the more convenient route through C-5 and the NLEX-Mindanao Avenue link. Joining DPWH secretary Rogelio Singson for the flyover's opening were Metropolitan Manila Development Authority chairman Francis Tolentino, Quezon City mayor Herbert Bautista and Quezon City 2nd District Representative Winston Castelo. Now, before you dream of blasting through the flyover, do note that only the northbound lane of the 490-meter-long flyover was opened. You'll have to wait until both the north and southbound lanes are opened to do just that.